For a pedal with the best features, quality, and sound customization options, the TC Electronic Hall of Fame 2 (Amazon) came out on top. And if you're looking for a high-end loaded pedal with excellent sound (6 reverb types from the get-go), the MXR M300 (Amazon) is hard to beat. For additional details and an overview showing how we came up with each of these picks, keep reading on below and we'll guide you through our process. Reverberation, or “reverb” as we all call it, can drastically improve your sound. Plain and simple. With each strum or pluck of your guitar, reverb can make it seem as if you're playing in a mammoth cave, an ancient cathedral, or even an atmospheric auditorium by "expanding" your sound. Great reverb can sound as if you're sitting in a big cave playing your guitar while every note you play bounces gracefully off the walls and echoes into infinity. Reverb isn't truly an "echo", but it sure sounds like one! It gives your sound a rich tone that lingers in the air, almost as if you have a "third dimension" added to your sound. It has the ability to take a dry sounding tone and turn it into an echoing masterpiece. And as a guitar player, or even for cellists, bass players, and the like, having a reliable high quality pedal will pay off big in the long run. When you're working with the best guitar effects pedals out there (in the highest quality and resolution), you really can't go wrong! And as a side note, if you want to learn more about reverb in general, Heroic Academy had a great post about everything reverb-related. Reverb Types: Play the Video Below & Hear the Difference! Did you play the video? Great! You can clearly hear the different types of reverb out there, and the differences between each. With a good reverb pedal, you'll be able to emulate these sounds -- and more! Read on to see our recommendations. What About Reverb Pedals for Bass Guitars? ​We recently took some of the most highly rated reverb pedals on the market and dug through the data. Which pedals have the best sound quality? Which ones are the most reliably manufactured and last the longest? Which reverb pedal gives you the most control, and comes with the highest levels of versatility? Well, you’re about to find out! This is your chance to look at the data and make an informed decision. First , the manufacturing quality of your reverb pedal is critical. A well manufactured pedal can last years, whereas a low quality one can have you running back and forth purchasing a new device every several months. One of the most common complaints about regular pedals on the market today is that their switches tend to go bad. Most commonly, these were reports of switches either burning out or simply failing in lower quality models. Next up on the list is sound quality. You want a pedal with that crisp, clear sounding reverb, right? You don’t want to be jamming out on your guitar and having your reverb sound like a cheap Fender Amp! Muddiness and noise are the enemies of crisp reverb. What pedal should you choose then? How do you avoid all these pitfalls and come out on top? Begin by looking at the rating table below. Let’s dig into the details. The TC Electronic Hall of Fame Mini shines with an absolutely remarkable sound. 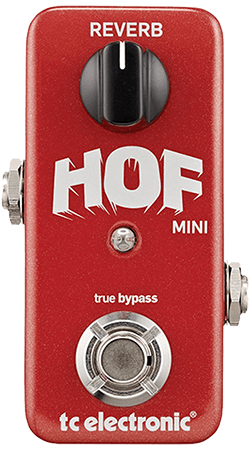 More than 90% of guitarists who bought the TC HoF Mini love their pedal -- it definitely comes out on top! Not only does it offer a crisp, clear sound, but it also comes with a free “TonePrint Editor”. 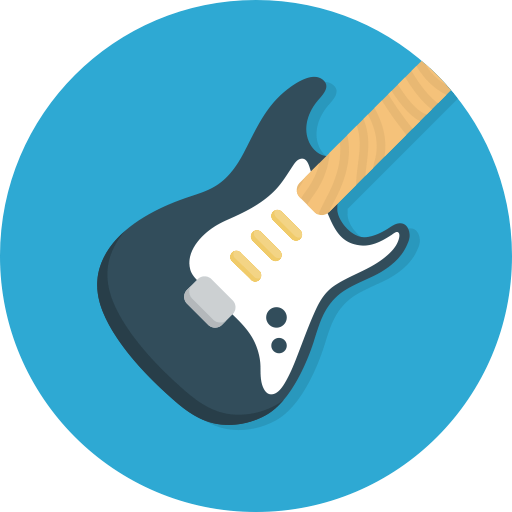 This editor lets you load custom sounds from some of the best guitar players in the world (Steve Morse, Paul Gilbert, and Steve Vai, to name a few). Pretty awesome, right? TC Electronic is a current industry leader when it comes to reverb. And it comes with all of these modes built right in: Cathedral, Plate, Room, Hall, and Spring. If you’re looking for a “mini” pedal to build into your rig, this is the real deal. You’ll have a hard time believing how good this thing sounds. Not only that, the number of sounds you can get out of this little guy is astounding! And if we were to put it bluntly, we don’t think there’s a reverb sound this pedal can’t deliver. It can do it all. The only potential downside is the fact that you need a smartphone or tablet to switch between toneprints (the built in sounds from legendary guitarists). This pedal runs on power from a 9V DC Adapter. This is a strong, durable pedal. There’s no doubt about it. The Donner Yellow Fall Vintage Analog is built from pure aluminum alloy. It comes with 3 reverb adjustment knobs: Echo, Time, and Feedback. Twist the echo knob to change the mix of your sound. Adjust the time knob to modify your reverb delay in a range of 20-620 milliseconds. And twist your feedback knob to increase or decrease repetitions. 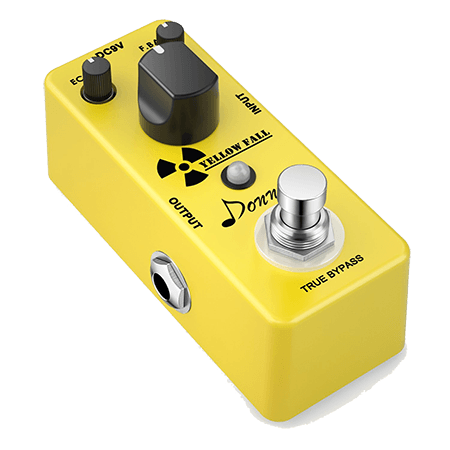 The Donner Yellow Fall Vintage is pure analog, working entirely off circuit delay electronics. It’s crisp, clear sound suits practically any genre of music. 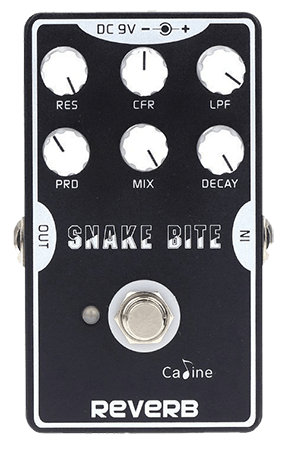 It has a tone that, to the moderately trained ear, has almost no distinct difference from expensive reverb pedals at the top of the market. And at its current price, this pedal is a great bargain. Frankly, we didn’t expect it to be this good. The price point coupled with its near five star rating and incredible sound make the Donner Yellow Fall Vintage hard to pass up. But nothing is ever perfect. You’ll need a 9V DC Adapter to power this pedal. After its all powered up, we’ve found that sometimes it’s difficult to accurately set the delay. You have to “feel it” to get it just right (it is an analog, after all). Another thing we noticed was the bypass switch. It’s great that this pedal has a true bypass switch (you actually hear that satisfying CLICK! ), but if you need to flip the bypass switch during a song, it’ll be fairly difficult. To be honest, if you need to turn reverb on and off multiple times throughout a song, this pedal probably isn’t right for you. Overall, the knobs hold their adjustment very well, it sounds amazing, and the size makes it extremely portable. This can be a great reverb pedal in the right hands. 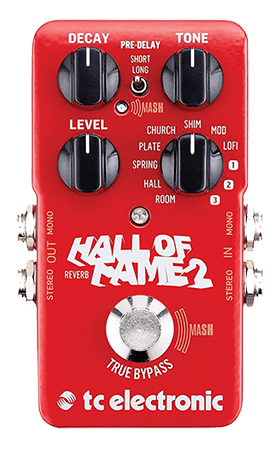 TC Electronic is back at it again with the Hall of Fame 2 Reverb Pedal. Even though it’s priced on the higher end, it has everything you could ever want in your reverb pedal. There’s a MASH Footswitch (changing reverb output based on foot pressure) and a Shimmer Effect you can activate. It also includes TonePrint (where you can load custom tweaks from famous guitarists), and stereo in and out ports making it extremely flexible with any setup. This pedal contains true bypass, ensuring there’s no loss of tone in its output. It lets you adjust on the fly, taking you from playing in a massive canyon, to outer space, to a gothic cathedral with the twist of a knob. Switch between dark warmth and crisp clarity, letting you accurately match whatever sound you’re trying to achieve. What we liked about this pedal the most was the fact that you could control any three TonePrint slots in the editor. You can tweak multiple parameters in the dry signal, modulation, reverb, and shimmer, letting you create any number of custom sounds. Just like the previous two, this pedal requires a 9V DC Adapter to operate. It’s a little on the pricey side, but to us, the features, quality, and sound customization abilities were well worth it. 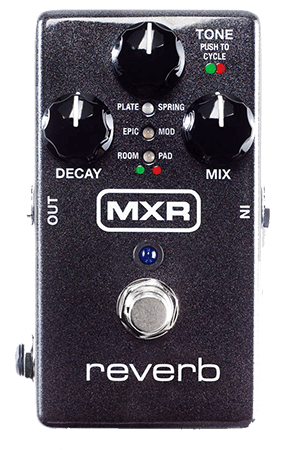 As the most expensive pedal on our list, the MXR M300 Reverb Effects Pedal comes preloaded 6 in 1. It has six built-in reverb types from the get-go. The dry path is 100% analog and it contains a true relay bypass. The footswitch is there too, coupled with a stereo in and out. This is a high-end pedal. Each of the built-in reverb styles sound just like the ones you’d hope to find in top of the line plug-ins and rack units. All you have to do to step through each setting is twist the tone knob (the LED light will show what you're modifying). First there’s the Plate setting. Often the first choice for anyone in the studio recording world, twisting the plate knob lets you adjust that shimmering smooth "wash of space" sound. Next you’ll find the Spring setting which lets you create authentic sounding reverb, and the Ep​ic setting for complex modulation and analog-tone delay lines. Changing the Mod setting lets you adjust modulation, the Room style adds projection and body to your guitar’s tone, and finally, the Pad style lets you add shimmer or synth/organ modulation, closing out your sound. You really can’t go wrong by having this on your pedal board. It’s super usable and very accessible. Most importantly, it has excellent sound! If you’re looking for versatility and the type of reverb that can fit anything, this is a pedal you should consider investing in. The Caline USA Digital Delay Guitar Pedal is a unique beast of its own. It comes with four distinct modes: PRD (pre-delay), LPF (low pass filter), CFR (center frequency), and RES (resonant). Changing the PRD knob lets you simulate delayed space. Twisting LPF cuts off higher frequencies of your reverb, and adjusting CFR sets your center frequency. Finally, the RES knob lets you simulate resonance and ramp up your echo. Control the ratio of wet and dry with the MIX knob, and adjust the delay time of your reverb by modifying DECAY. With regards to price, the Caline Digital Delay Pedal is on the lower end. We’ll even go as far as to call it dirt cheap! However, this is no reason to underestimate this pedal’s sound. The tone it produces is warm and sounds great. Overall, it’s an incredibly versatile device that can go from sounding “really dirty” to “really clean” in a matter of moments. If you’re looking for a good deal on a reverb pedal and value versatility, the Caline Digital Delay Pedal will do the job. When faced with the choice of "Analog vs. Digital" my recommendation would be to go analog every time (if possible). I'll explain why in a short second. First, let's look at the difference between analog and digital signals real quick (for some background). Analog signals have an infinite number of possibilities, whereas digital signals are limited to a finite range. While analog signals (and their respective waves) are very continuous and smooth, digital signals contain a series of "steps". Image Source: Analog Signal Graph by SparkFun is Licensed Under CC BY-SA 4.0. No changes. The illustration above shows what a continuous analog signal looks like. No breaks, no steps. It flows without end to infinity. Image Source: Digital Signal Graph by SparkFun is Licensed Under CC BY-SA 4.0. No changes. You can see the distinct steps. I like to think of digital signals as "on" or "off", while analog signals can live anywhere in a specific range. Image Source: Analog Waveform by SparkFun is Licensed Under CC BY-SA 4.0. No changes. It clearly looks similar to the smooth analog sine wave we saw above. The only difference? It's still a series of discrete "steps" rather than one continuous signal. As you might imagine, the signals your reverb pedal takes in and pushes out are going to be of a much higher resolution in analog. A digital pedal is going to emulate the signal the best it can with a "step function" digital output, but it'll be slightly lower quality. Sometimes this difference in quality is indistinguishable. But sometimes you can clearly tell. This is actually the case with record players. 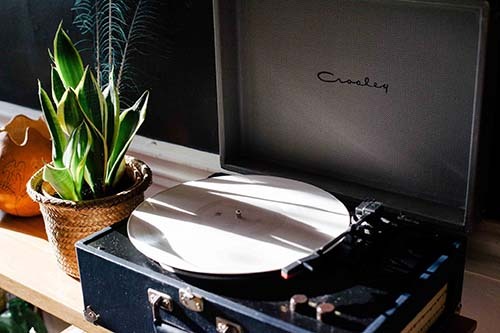 Digital record players have that distinct "scratching" noise that you hear. When you listen to a digital record player with no reference point, you're essentially hearing the music and it sounds great. But compare it to an analog record player... and you'll clearly see the difference. Night and day. So as I mentioned earlier, sticking to analog reverb pedals (or any guitar effects pedal, for that matter) won't hurt you. You'll be certain that you have the highest resolution you can have, and sound crisper and clearer than ever! In order to "shrink" down reverb-generating hardware, there were several methods developed to generate reverb since the late 1930's. One of these methods is Spring Reverb. It works by having springs and plates (typically made of metal) in an air-filled compartment (the base of the pedal). Once you play a note on your guitar, the signal gets sent into the springs, causing them to vibrate. Once the springs start vibrating they begin generating sound waves, which are then picked up by a receiver (i.e. pickup) inside of the pedal compartment and sent out to your amp! An output signal that sounds as if you were playing in a large, open, airy room -- also known as the reverb effect. There are plenty of pedals out there today with real springs. But from our list above, the MXR M300 (Amazon) has an authentic-sounding "spring" setting. If you don't an excessive "spring-like" tone but something that sounds "just right", the MXR will do the job well! The bottom line is, a reverb pedal for an electric guitar is going to work just as well (in almost all cases) on a bass guitar. Your pedal doesn't really "know" where the sound is coming from, after all. It can't distinguish between sound coming from a bass or an electric. All it does is take the incoming signal, process it, and send out the result to your amp. So, you might be asking yourself, why do bass pedals even exist then? It's because bass effect pedals are optimized for bass frequencies, giving the lower-end that extra bit of "oomph" and sound quality. If you're using a regular electric pedal and don't adjust the treble to suit you (this is how you can make an adjustment for bass), the sound may get "muddied up" and lose its clarity. In a lot of these bass pedals, all they did was lower the sweep of the potentiometer inside of the pedal. This means you could literally open the pedal up, adjust the potentiometer position, and "convert" it into a regular pedal (Source - Chris Grimmoire). All in all, you could use a regular guitar effect pedal for your bass, and it'll work just fine. Or, if you want to go the extra mile, you could get a bass pedal with optimized frequencies. ​Before we dig into the details, I'd recommend using stereo pedals whenever possible for one reason: Increased perception of space. Mono ​Audio Output (monoaural sound) only uses one single channel. No matter how many different speakers or sound outputs there are, it duplicates the same signal across all outputs. Stereo Audio Output (stereophonic sound) uses more than one channel. Typically when we talk about stereo we're talking about two channels. Imagine you wanted to record your voice in stereo. How would you do it? Well, you'd take two microphones and put one on your left and one on your right and record the signal from each microphone into a different channel. ​Now imagine you were wearing headphones and playing back your recording. When you play the sound, you'll distinctly hear the LEFT channel playing in your left ear and the RIGHT channel playing in your right ear. ​The illustration below gives a ​ good high-level view of stereo vs mono. I'd recommend stereo reverb pedals because they process in stereo, giving you the closest output to original stereo sound that you can get. ​Ultimately, the choice is yours, but ​my hope is that you see the benefits of getting a stereo pedal and the type of flexibility it can give you in your setup.